He shoots, he scores! And, the crowd goes wild. You can hear their roar. 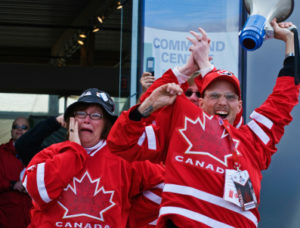 Hundreds of excited fans flood the streets, waving their team’s flag proudly, while horns honk in response. In homes across the city, viewers at home jump in excitement while embracing their friends, with giddy grins on their faces. A last minute win – the true sports fan’s dream. With the upcoming line up of sporting events this winter including the SuperBowl and the Winter Olympics, sports fans of all kinds will be glued to the television. Rooting for your team can affect your health, both positively and negatively. It’s absolutely amazing that simply watching a sporting event can change your mood, elevate your stress level, alter your hormones, and the way you eat. There is nothing quite like that feeling of glory when your team wins. Who doesn’t like to identify with successful people or teams and enjoy basking in the reflected glory? Psychology researchers suggest watching your favourite team win increases self-esteem, mood, cortisol  (a stress hormone), and testosterone levels. When saliva samples of 21 male fans watching a World Cup soccer match were compared, testosterone levels increased in fans of the winning team and decreased in fans of the losing team. The Challenge Hypothesis can explain the rise in testosterone because testosterone levels of watchers increase in preparation to defend or enhance their social status. During the 2010 World Cup finals between Spain and the Netherlands (since you’re itching to know, yes, Spain won), researchers observed 50 Spanish soccer fans and found similar elevated levels of testosterone levels, and elevated cortisol levels (wow, some stressed out fans). Interestingly, the younger and more avid fans had higher cortisol levels during the game. Watching your heroes win or lose has physiological consequences. You are not just watching your sports team – your body is reacting and responding to the game. When athletes in a game were tested for hormone changes they experienced a similar increase in testosterone and cortisol during a win and decrease during a loss. Thus, the physiological effects sports fans experience watching the game are similar to those experienced by athletes in the sport. It is almost like you are in the game. The outcome of the game is likely effecting your waistline. According to a paper published in Psychology Science in 2013, when fans’ favourite teams lose, it increases their consumption of less healthy food. The study found that on Monday, following a Sunday National Football League (NFL) game, fans in cities of losing teams ate more saturated fat and a higher number of calories than fans in cities where teams won. The effect was greater in cities with more committed fans. Interestingly, in cities where the NFL team had not played on the Sunday there was no change in dietary consumption. Similar results were seen when the researchers measured food consumption of French soccer fans. Listen up sports fans! Adorn your jerseys, paint your faces and get your best cheers ready – here comes an amazing few months of sports. But, remember no matter who wins the Super Bowl or takes home the gold medal your body is reacting to the outcome.